I have mixed feelings about part 2 of this recipe. It involves a lot of hot, sticky, floury mess and fussing about with clingfilm and baking parchment, which when combined with quickly melting ice cream makes for an expletive-filled experience. At least in my case it did. I’m posting it anyway because I’m sure you’re a more organised cook than I am, and the finished product still tastes really good. I now completely understand why none of the mango mochi sellers here on the island sells an ice cream version – very sensible of them. If the ice cream + mochi combination is too much to contemplate, both recipes can be cooked as standalone efforts. The mango ice is delicious by itself or mixed with vanilla ice cream, and a chunk of juicy mango makes a more-than-adequate filling for the mochi – or you could use store-bought ice cream in place of the homemade one. I made two different sizes of mochi. 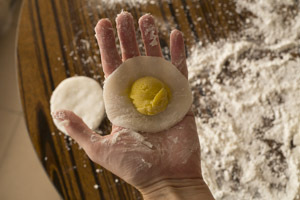 For the first batch, I used an 8cm (3-inch) cookie cutter for the mochi wrapper, and used a ½ tablespoon measuring spoon to scoop out spheres of ice cream – this made a bite-sized ice cream mochi. For the second batch, I cut out the wrappers with a 9cm (3.5-inch) cookie cutter that wrapped a tablespoon-sized ball of ice cream, making a two-bite mochi. The latter gave a better ratio of ice cream to mochi, so I’d stick with that personally. 1. 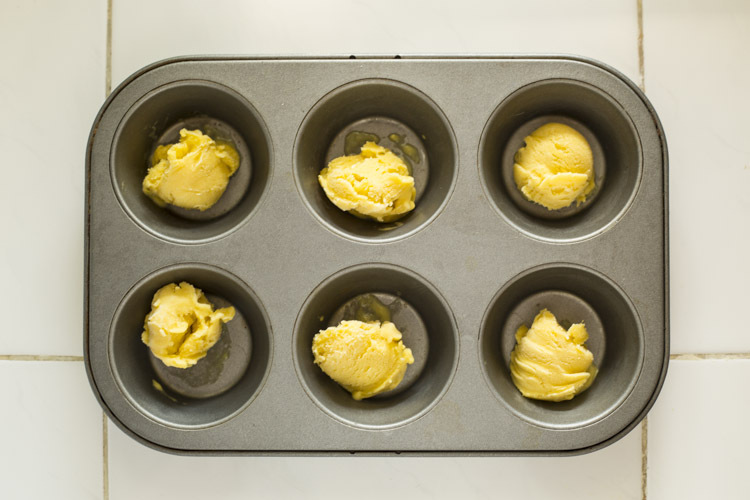 Scoop tiny balls of mango ice cream into a muffin pan. I used measuring spoons for this, but you could use a cookie batter scoop or a melon baller if you have one. Put the pan back in the freezer for an hour or two – the firmer the ice cream the better. 2. 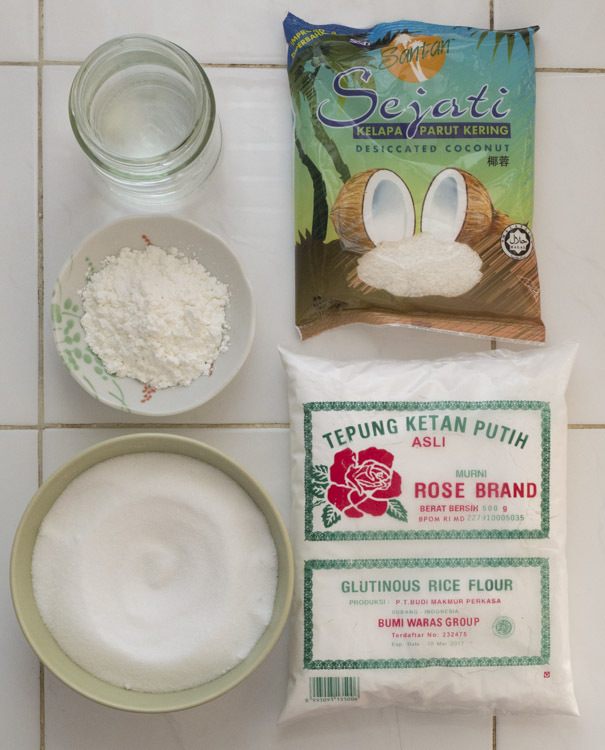 Whisk the rice flour, sugar and water together in a heatproof bowl. You should end up with a very liquid batter – don’t worry too much about small lumps, as these will disappear when you cook it. By microwave – loosely cover the bowl with clingfilm and microwave on full power (assuming a 1200W microwave) for 1 minute. Carefully peel back the clingfilm and scrape the bowl down, then cover it up again and microwave for another minute. Repeat the scraping step and microwave again for 30 seconds. 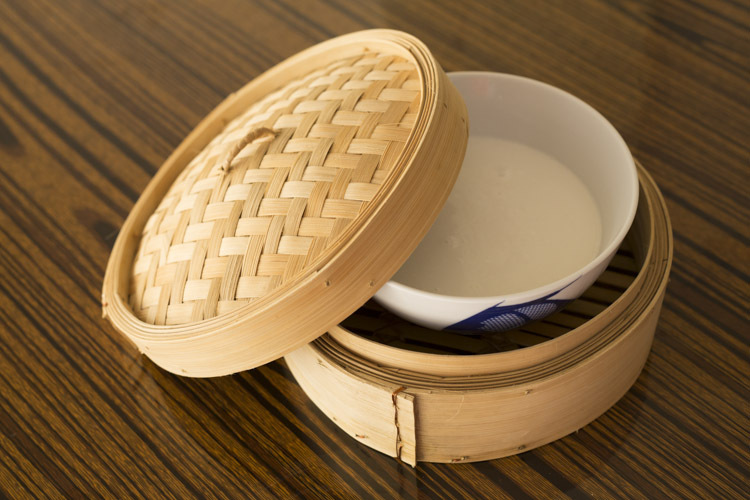 On the stovetop – put the bowl in a steamer and place over a pan of boiling water. Steam for 15 minutes, stirring and scraping the bowl down once halfway through. 4. While the gloop is cooking, prepare a clean worksurface for the mochi mayhem to come. Cover the surface with a sheet of baking parchment (which, you’ll note, is a precaution I failed to take). 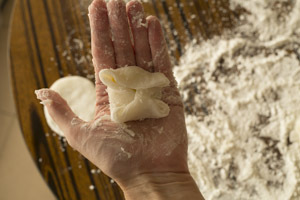 Sprinkle the parchment and a rolling pin with a thick layer of cornstarch or potato starch. 5. Scrape the gloop onto the baking parchment and cover your hands in starch while you wait for it to cool slightly. 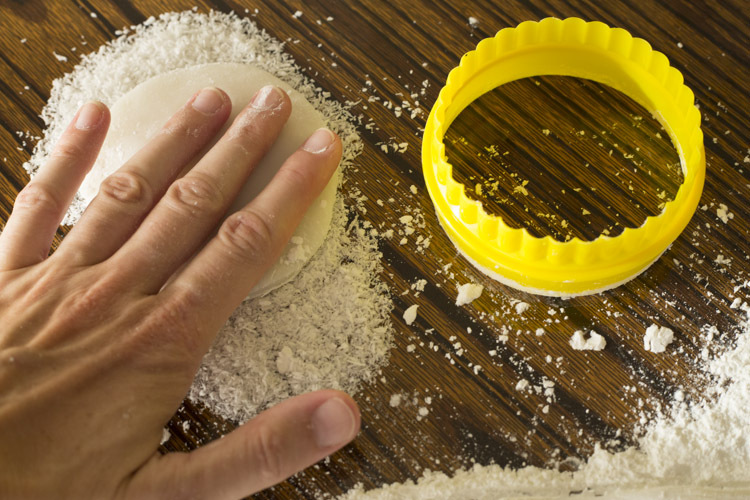 Then carefully use the rolling pin to flatten it out until the dough is a little less than 5mm (1/4 inch) thick. Put the parchment on a baking tray and into the fridge for 10-15 minutes. 6. Sprinkle the desiccated coconut onto a plate. Take the mochi out of the fridge and use a cookie cutter to cut out circles. Shake off any excess cornflour, then pat one side gently in desiccated coconut. Set aside while you repeat the process on the remaining mochi dough. 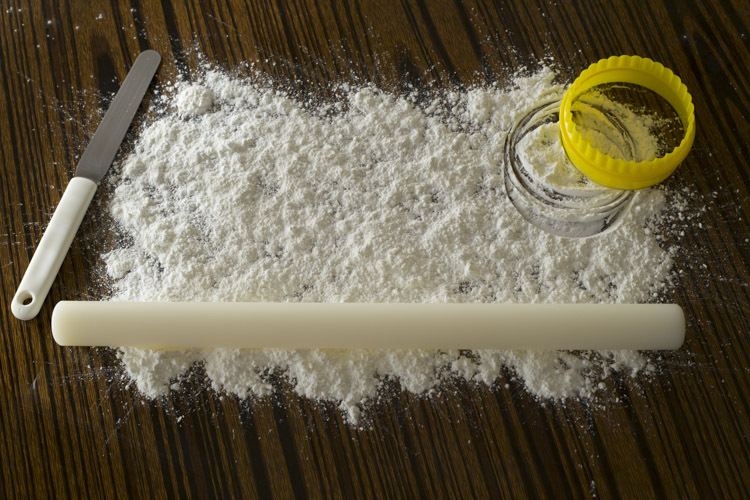 Any scraps can be re-rolled, although the cornflour means that the results from the second rolling generally aren’t as good as the first lot. 7. Take the ice cream balls out of the fridge and, with a mochi skin in one hand (coconut side down), put a ball of ice cream into the middle of the skin and quickly pinch the edges together around the ball of ice cream. 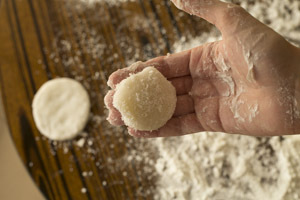 Twist each ball up in a little square of clingfilm and return to the muffin pan while you repeat with the other mochi. Refreeze for an hour or so, letting the finished mochi spend a few minutes at room temperature before eating. Although they’re best eaten soon after making the finished mochi keep well in the freezer for a week or so. 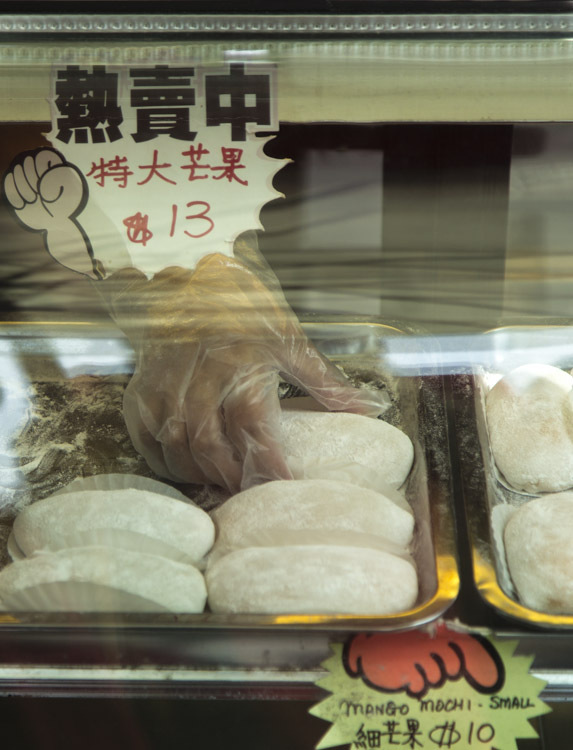 If they’re frozen hard you’ll need to let them sit at room temperature for 15-20 minutes before eating to let the mochi skin defrost.